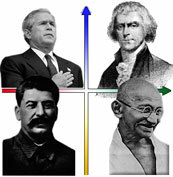 The previous political test I posted was, as I and several others noted, rather simplistic. I found a better one, or least one that is a bit more in depth. This one has me outside the centrist circle, and slightly into the democrat camp. I don't necessarily disagree with it, for the purposes of this election. The goal of this test was to exactly classify your personal politics, without the traditional labels. We avoided the edgy party issues and focused on fundamental values. Your score is a measure of what you believe in, economically and socially. For example, on the economic axis, a highly permissive system, like the American system of the early 1900s, might mean things like low taxes and increased scientific innovation. It might also result, as it did back then, in unrestricted child labor and millions of poor people with black lung. At the other end of the economic spectrum, a highly regulated system might conserve the environment, establish national health care, and eliminate poverty. But as we've learned from the Soviet system, extreme regulation can also lead to stagnation, sameness, and unhappiness. The test is here, on the OK Cupid site. See how you do. I'm a socialist according to this quiz. Which is probably a lot more correct than the previous test. This time I am a social liberal, 80% permissive and economic moderate, right at 50%. I'll buy that. Though it sticks me in with the Democrats. Hell, that party scares me nearly as much as the main alternative, though for different reasons. 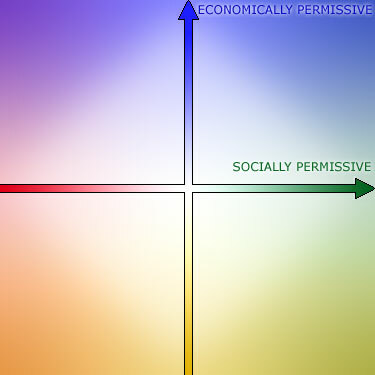 Social Liberal - 75% permissive. Economic Liberal - 33% permissive. In other words, a Democrat. Maybe you're just off the chart? One thing they should have mentioned is that highly regulated economy does not eliminate poverty, it just equalizes everyone to a specific poor level. Just like in Soviet Union. Jeri, mine didn't show up right away, so I toggled to the "famous people" version, etc. and then when I came back to the "basic" it came up right. Mine was much closer to socialist than I thought it would be. I might take it again when I'm in a different frame of mind. Some of the questions did not present what the government's role would be, like "everyone should have the necessities of life" -- isn't that what we contribute to charities for? I'll do it again but (like with fortune cookies and "in bed") will add "through the government" at the end of all of them. I was a centrist liberal-leaning libertarian in the last one and a social liberal (76% permissive) and economic moderate (33%) in this one. I don't know why that makes me a Democrat/Socialist in this quiz. Maybe I have split-personality disorder. Neurondoc, i think it comes to both the level of detail of the two tests, and the fact that each test creator has a different set of biases. Or hell, it could also come down in part to your mood whaen you took each test. Not surprisingly, I am solidly in the socialist camp: Social Liberal (73% permissive) and Economic Liberal (13% permissive). I actually am a bit libertarian in some respects, but apparently not enough to balance out my neo-hippie, tree-hugging sides. I'm pleased to see all my fellow socialists. I can say that the options in many of the questions did not actual fit my believes and I was often forced to select the best of two opposites. I suspect that we may have discovered a bias.